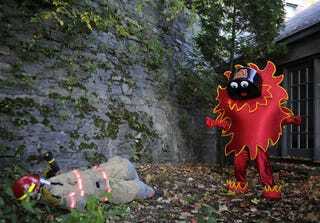 Choosing to go in a different direction than the wanton killing of first responders, the AHL's Adirondack Flames have decided to smother the short, eventful life of would-be mascot Scorch. "We're extinguishing Scorch," Brian Petrovek, president of the Adirondack Flames, said in an interview on Tuesday. "The misjudgment we made was such that we came to that decision." The Flames quickly released a statement apologizing for the particulars of Scorch's unveiling, but the damage was done. Scorch is, after all, a cheaply constructed anthropomorphic flame whose only possible upshot is teaching kids it's OK to touch fire. So even as the embers of Trevor Gillies's inexplicable hockey career still smolder, the Flames poured a bucket of sand on top of Scorch, and then kicked some wet earth over his ashes. 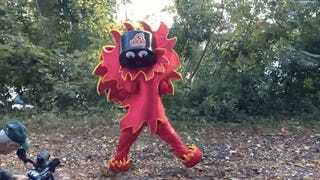 The mascot did not appear at the Flames' home opener at the Glens Falls Civic Center on Saturday, and will not appear ever. Petrovek said the management is designing a new mascot that will be associated with fun, not fear. God bless you, Scorch. May you dance on forever, and find your way through the dark.